Ranneko Plays Games And Also Writes Things: What is a Game? Every so often the same discussion flares up what is a game exactly. Generally I see it in the video game space, triggered by statements like "Mountain isn't even a game!" or "I don't consider Dear Esther a game". Personally I think these discussions are both a complete waste of time and really interesting. Ultimately I don't think we need a firm definition for game because basically any firm definition that I have seen cuts off titles that are generally recognised as games. Mostly this debate is seen as a way of dismissing titles that particular people don't enjoy. To me the titles that these conversations tend to be made about present themselves as games and use the same techniques and so it makes sense to treat them as game regardless. That said I really enjoy reading the discussions when they are conducted in a calm, intelligent manner, I like seeing people put up ideas of definitions and categorizations and seeing other people poke holes in them. So the rest of this post is series of thought experiments using Snakes and Ladders, adding and removing elements and asking at each point if what we have left is a game. 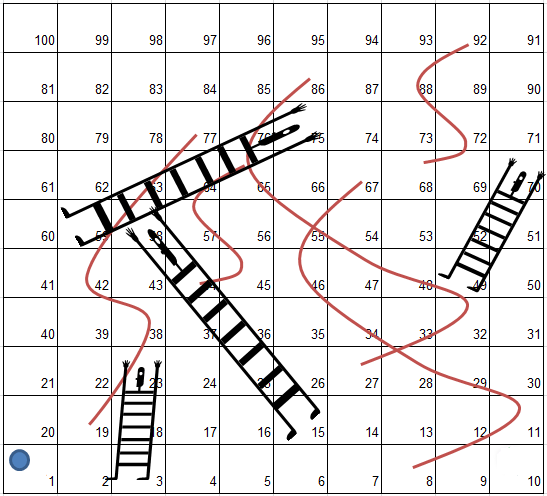 Why Snakes and Ladders? Because it is a really simple game (with a surprisingly interesting history), so that means I can assume readers are familiar with it and it is really easy to tinker with. I can also make a terrible but recognisable version using Excel and clip art! One of my best friends insists this is not a game, it is merely a goings on. 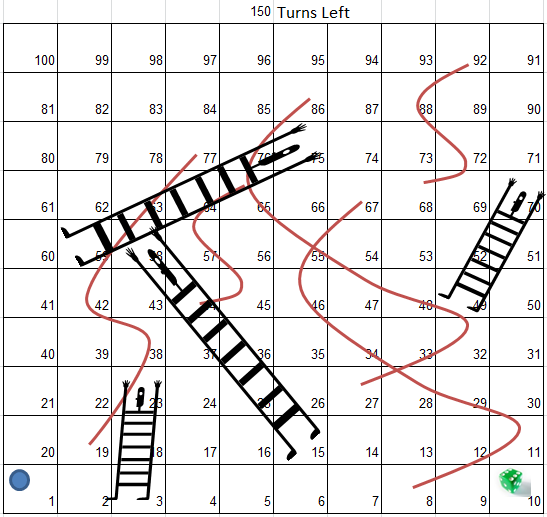 There is a reason why you only really play Snakes and Ladders with small children. There are no choices or skills involved. 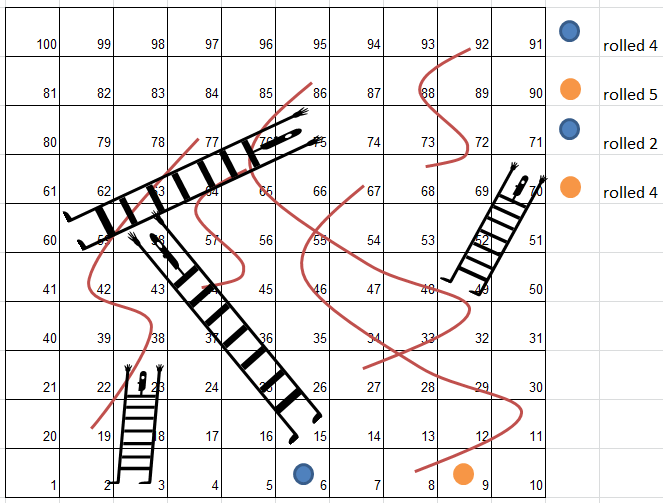 Player turns consist purely of rolling a die and moving a piece, as a result the winning player didn't actually do anything better than anyone else, they were just the luckiest. Experiment 2: The Game That Plays Itself! Pick a colour and watch it go, the game rolls the dice and moves the tokens without you using fancy circuits and magnets. The game follows the rules perfectly just like you, all the advantages of playing Snakes and Ladders in just a fraction of the time! What if, before you roll your die, you pick the direction you move, positive or negative. Now there is decision making in play, you just mossed that awesome ladder that skips 40 spaces? What if you can gamble on turning back? Lets take away competition, just a single player and the game. They cannot lose, bad luck can only stave off the end of the game. Now add a timer, you lose if you don't reach the end before turn 50. We can lose again, does this make it a game? What if the timer is set such that you have a 99.99% chance of finishing? You have 150 turns to finish. The failure state is now only theoretical, does this matter. So what do you think? Which of these experiments would you consider a game? How does your pet definition hold up?